What has flippers like a penguin, a neck like a swan and a posture like a duck? It’s the newly discovered Halszkaraptor escuilliei or “Halszka”– a bizarre, semi-aquatic dinosaur with a collage of features never seen in any other prehistoric creature. 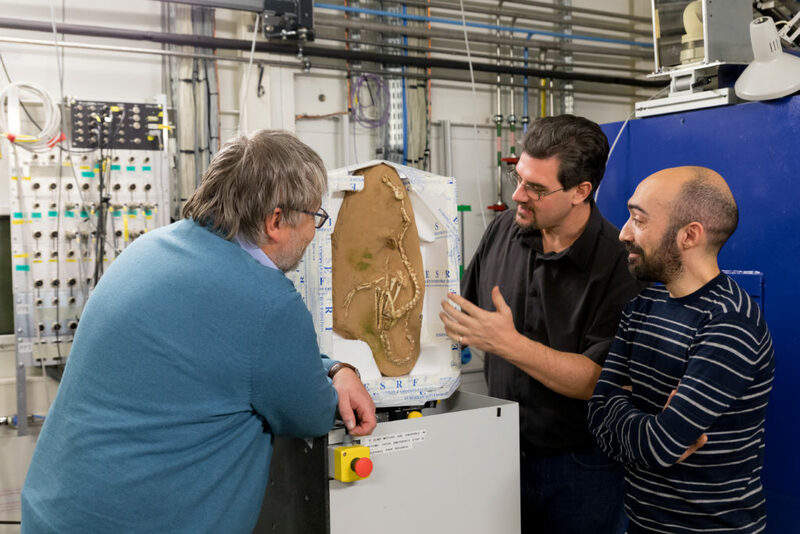 On Wednesday, researchers reported in Nature that this brand new dinosaur genus and species lived about 75 million years ago during the Campanian stage of the Cretaceous period. 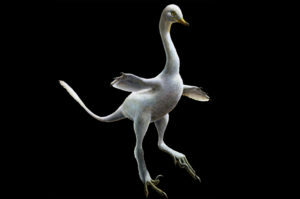 Halszka was the size of a modern-day goose, and despite its amphibious lifestyle and small stature, it was a predatory raptor akin to its relative the velociraptor. Mysterious origins: This fossil was found partially embedded in a 3-foot-long rock in Ukhaa Tolgod, Mongolia — an area known to paleontologists as a poacher’s paradise. This fossil has a mysterious backstory. It is unknown when exactly it was discovered, and it was circulated on the “black market” for fossils for several years, Andrea Cau, paleontologist at the Giovanni Capellini Geological Museum in Bologna, Italy and lead author of the study, said via email. How scientists know Halszka is one-of-a-kind: Halszka is a theropod, like the velociraptor and tyrannosaurus rex, a group that reigned supreme (on land) during the Mesozoic era. Though enigmatic, this species has some close theropod relatives in Mongolia, which, thanks to this study, are now united under one group called “Halszkaraptorinae,” a subfamily of raptors. But even so, Halszka’s features diverge quite a bit from its ancient relatives because they resemble today’s aquatic or semi-aquatic birds and reptiles. Cau and his team wondered if these quirky features were accidentally concocted by a hodgepodge of other species being buried in the same rock. 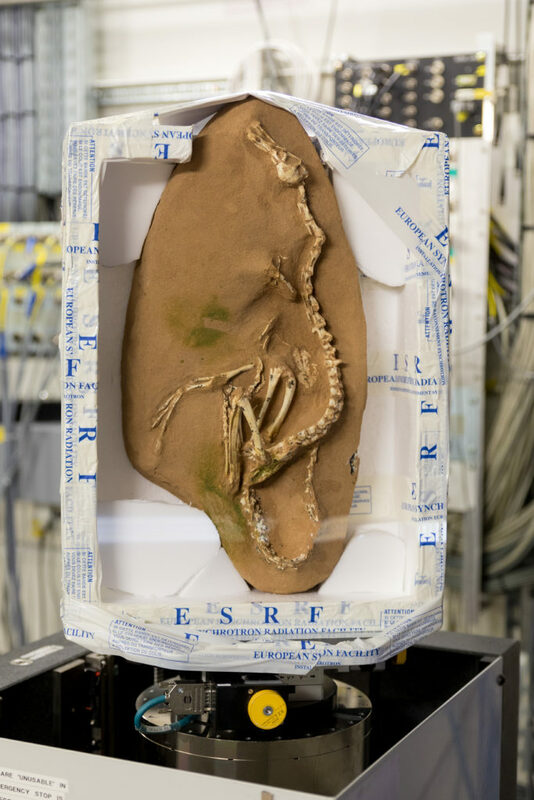 To confirm the authenticity of Halszka, the team scanned the specimen with the European Synchrotron–a massive instrument that charges particles at high speeds to make sophisticated 3D images. The technique allowed for a detailed look inside the rock. The fossil was indeed the full animal’s body, and “is the first [discovered species] with swimming adaptations in the forelimb,” Cau said. They also found a mouthful of teeth and a snout structure that resembles crocodiles. Strange features? Halszka is bipedal–or walks on two legs–like all other theropods and has sickle-shaped claws. These traits were likely useful for walking on land and snagging prey with its feet. The dino also had stubby flippers instead of wings or arms, which helped it glide through water. Scientists determined based on the shape of its flippers that Halszka couldn’t fly. Its long neck, used on land or underwater, is ideal for ambush hunting.